Scientists are learning more about some of the changes in DNA that cause cells in the pancreas to become cancerous. Inherited changes in genes such as BRCA2, p16, and the genes responsible for hereditary non-polyposis colorectal cancer (HNPCC) can increase a person’s risk of developing pancreatic cancer. They have discovered that pancreatic cancer does not form suddenly. It develops over many years in a series of steps known as pancreatic intraepithelial neoplasia or PanIN. 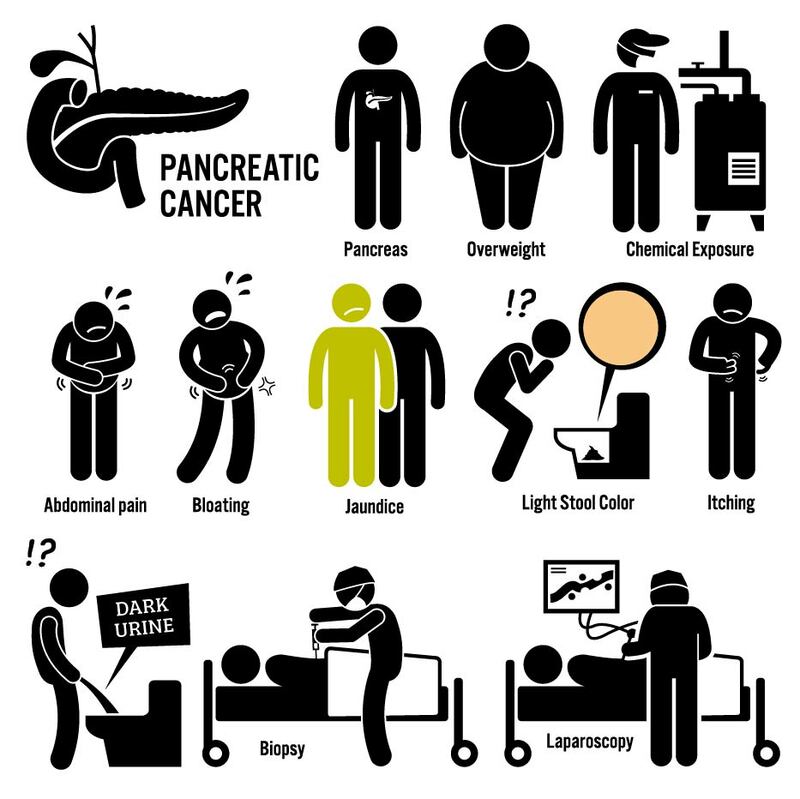 In the early steps, such as PanIN 1, there are changes in a small number of genes, and the duct cells of the pancreas do not look very abnormal. In later steps such as PanIN 2 and PanIN 3, there are abnormalities in several genes and the duct cells look more abnormal. Researchers are using this information to develop tests for detecting acquired (not inherited) gene changes in pancreatic cancer precancerous conditions. One of the most common DNA changes in these conditions affects the KRAS oncogene, which affects regulation of cell growth. New diagnostic tests are often able to recognize this change in samples of pancreatic juice collected during an ERCP (endoscopic retrograde cholangiopancreatography). Any one of these symptoms could mean numerous things. If you find yourself experiencing two or three of them, contact your physician and ask for a scan. The Mayo Clinic published startling research showing that 40 percent of pancreatic cancer patients had been diagnosed with diabetes one to two years before discovering they had a pancreatic tumor. Diabetes is very common, and the majority of diabetes isn’t pancreatic cancer, so the need for an EARLY DETECTION tool is crucial. Pancreatic tumors can block the bile duct in the head of the pancreas, causing bile to build up. This causes jaundice. A side-effect of jaundice is itchy hands and feet. It’s due to a skin reaction to the bilirubin, the yellowish brown liver chemical that causes jaundice. Six to eight months before being diagnosed, with pancreatic tumors, patients reported a sudden drop in their appetite and a tendency to feel full after eating very little. Some patients surveyed said they’d suddenly lost their taste for coffee, wine, and smoking. In fact, they said, they felt “disgust” for the smell and taste of coffee and alcohol. Pancreatic cancer sufferers remember this pain as a gnawing pain, rather than a sharp cramp or ache, and it radiates toward the back. The same blockage of the bile duct that causes jaundice can also cause an enlarged gallbladder, as the bile builds up behind the duct. If a pancreatic tumor prevents digestive enzymes from reaching the intestine, the result is an inability to digest fatty foods. So you end up with loose, smelly “floaters” as a result of the excess fat. Doctors say this symptom, in particular, can be an early clue and is too often overlooked. Bleeding in the upper intestines causes this symptom. Weight loss is not always, as many people mistakenly believe, a sign of advanced cancer that’s spread to the liver. It can also happen because a lack of pancreatic enzymes is causing fat to pass through the body undigested. Pancreatic cysts affect up to 2-8 percent of the U.S. population. A pancreatic cyst is a collection of fluid on or in the pancreas. Many pancreatic cysts are benign and are not associated with any symptoms, but some may be cancerous or pre-cancerous so it’s important to see your doctor if you have a diagnosed or suspected pancreatic cyst.